Some said Celilo isn't gone. "It's there, intact, under the waters. And someday, it will return. DALLESPORT, Wash. -- On April 25, 2012, representatives from four tribes, the Bureau of Indian Affairs, and the Army Corps of Engineers all stood by the Columbia River to mark the end of a construction project both useful and symbolic. It was the completion of the 31st -- and final -- fishing access site on the river, giving tribes the ability to use their traditional fishing grounds and village sites, which they had lost access to due to dams on the river. The moment harkened back to another gathering, that of the Bonneville Dam's fiftieth anniversary in 1987, when the U.S. Army Corps of Engineers and the Bonneville Power Administration threw a big celebration called, "Roll on, Columbia," immortalized earlier in Woody Guthrie's ballad about the dam. Dignitaries arrived from near and far. Hundreds joined the VIPs to celebrate the first of eight federal dams on the Columbia/Snake river system dedicated Sept. 28, 1937. Somehow the Corps and the BPA forgot to invite the Indians displaced by the hydroelectric power. But the four Columbia River treaty tribes, the Umatilla, Yakama, Warm Springs, and Nez Perce didn't join the revelers. Instead they set up their tee pees and an oversized drum on the Washington side of the project and took up a 50-hour vigil, mourning lost salmon, and their river way of life. The Bonneville Dam and its successors flooded fishing sites and villages, including the oldest continuous human settlement in North America, the 15,000-year-old thundering Celilo Falls. Treaties in the 1850s guaranteed the Natives the rights to their fisheries in exchange for the peaceful cession of most of their territory. By the late 1880s investigating Indian agents found that non-Natives had encroached on many of their treaty fisheries. The U.S. filed lawsuits to protect the tribes' fishing rights, and legal determinations established their treaty-protected right of access to usual and accustomed fishing grounds. When Congress enacted Public Law 100-581 in 1988, a law intended to replace tribal treaty fishing and village sites, the Corps began work with the treaty tribes on a government-to-government basis to develop 31 in-lieu and treaty fishing access sites in Oregon and Washington, and redevelop the Celilo Indian Village in Oregon. 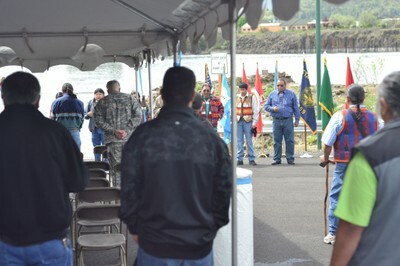 The government fulfilled that obligation April 25 with the completion and dedication of the 31st Columbia River Treaty Fishing Access Site in Dallesport, Wash.
"These 31 sites, over 600 acres along the Columbia River are legally considered Indian country," Columbia River Inter-Tribal Fish Commission executive director Paul Lumley (Yakama) said at the dedication. It was a tribally-driven project from the beginning, Lumley said, with the four treaty tribes directing the work. CRITFC provided office space, and the tribes ensured cooperation from the Corps, BPA, U.S. Department of the Interior, and the Bureau of Indian Affairs. The projects included land acquisition, and facility developments. Some sites have road improvements, boat ramps and docks, water supplies, sanitation, camping, and support facilities. Four of the sites are undeveloped and provide river access. Non-Indians are allowed in only to purchase salmon from tribal fishers. "These are really jewels of sovereignty we've been creating," Lumley said. "When these dams were built there was a promise made to replace the villages and the sites. I want to hold the BIA's feet to the fire for finishing all the redevelopment projects." Can any replacement sites make up for losing Celilo Falls? Facial expressions of tribal fishers turned to dismay. "No." "Never." Some said Celilo isn't gone. "It's there, intact, under the waters. And someday, it will return." Terri Hansen writes about indigenous people and the environment. Her blog is at Mother Earth Journal.